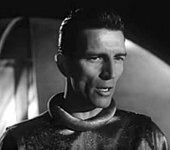 Michael Rennie (born Eric Alexander Rennie; 25 August 1909 – 10 June 1971) was a British film, television and stage actor, perhaps best remembered for his starring role as the space visitor Klaatu in the science fiction film The Day the Earth Stood Still (1951). In a career spanning more than 30 years, Rennie appeared in more than 50 films and in several American television series. Eric Alexander Rennie was born in Idle near Bradford, West Riding of Yorkshire, the second son of a Scottish wool mill owner, James Rennie, and his English wife Amelia (née Dobby). He had an elder brother William, younger brother Gordon and sister Edith. Rennie's family owned a wool business which had operated for over 150 years and were relatively well off. He was educated at the Leys School, Cambridge. He went to work at the family wool mill in Bradford, but did not enjoy it. He worked in a number of occupations, including a stint as a car salesman, and sweeping floors in his uncle's steel ropes factory. He eventually decided (at the time of his 26th birthday, in 1935) on a career as an actor. He retained his surname but adopted Michael as his professional name. He cited Ronald Colman as his role model. While that film was being prepared, Rennie continued repertory work and accepted a one-line role in George Formby's Turned Out Nice Again. Balcon says Rennie "declared that he enjoyed it as he was playing a motor salesman, and this reminded him of the days when he tried to sell cars – without securing a single buyer." He followed this in another movie with Lockwood at Gainsborough, the sensual costume adventure The Wicked Lady (both 1945). Rennie was the fifth lead, beneath Lockwood, James Mason, Patricia Roc and Griffith Jones. but it was a good part (the one true love of Lockwood's character) and an excellent project to be associated with – the year's biggest box-office hit, subsequently being listed ninth on a list of top ten highest-grossing British films of all time. Gainsborough teamed him with one of their biggest female stars Phyllis Calvert in the melodrama The Root of All Evil (1947). In July 1946 it was announced Rennie had signed a five-year contract with Maurice Ostrer's new company, Premiere Productions, worth £300,000 – making him the highest paid film star in Britain. Rennie was one of several English actors cast in the 20th Century Fox medieval adventure story The Black Rose (1950), shot in England starring Tyrone Power and Orson Welles. Rennie was specifically cast as 13th century King Edward I, whose 6' 2" (1.88 m) frame gave origin to his historical nickname "Longshanks". He was fifth-billed after Cécile Aubry and Jack Hawkins. Rennie became good friends with Power, who spoke well of the actor to Fox executives. Rennie went on to support Power in I'll Never Forget You (1951) then had good roles in the ensemble drama Phone Call from a Stranger (1952) (where he played an American) and in the wartime spy thriller, 5 Fingers (1952), as the agent who tracks down James Mason's spy. He did some narration for The Desert Fox: The Story of Rommel (1951) and would provide voice overs for several Fox films, such as Pony Soldier (1952), Titanic (1953), The Desert Rats (1953), Prince Valiant (1954). In Désirée (1954), Rennie played the future Charles XIV John of Sweden opposite Marlon Brando as Napoleon Bonaparte. The film was popular though is not as highly regarded as other Brando films from this time. Soldier of Fortune (1955), was another hit, with Rennie as the head of British police in Hong Kong supporting Clark Gable and Susan Hayward. Based on the positive reaction to his two turns as the Apostle Peter, Fox assigned him another third-billed, top-tier role as a stalwart man of God, Franciscan friar Junípero Serra, who, between 1749 and his death in 1784, founded missions in Alta California. The film was Seven Cities of Gold (1955), with Richard Egan and Anthony Quinn. Rennie became a familiar face on television, taking the role of Harry Lime in The Third Man (1959–65), an Anglo-American syndicated television series very loosely derived from the film. It ran for several years but the schedule meant Rennie had plenty of time off to work on other projects. "Every scene of every show I do for money", he said. During the 1960s, Rennie made guest appearances on such series as The Barbara Stanwyck Show, The Americans, Route 66 (a portrayal of a doomed pilot in the two-part episode "Fly Away Home"); Alfred Hitchcock Presents; Perry Mason (one of four actors in four consecutive episodes substituting for series star Raymond Burr, who was recovering from surgery); Wagon Train (a 90-minute colour episode as an English big game hunter); The Great Adventure (in an instalment of this anthology series about remarkable events in American history, he portrayed Confederate president Jefferson Davis); Daniel Boone, (in the episodes "The Sound of Wings" and "First in War, First in Peace"); Lost in Space (another two-part episode—as an all-powerful alien zookeeper, "The Keeper", he worked one last time with his Third Man co-star Jonathan Harris); The Time Tunnel (as Captain Smith of the Titanic, in the series' premiere episode); Batman (as the villainous Sandman, in league with Julie Newmar's Catwoman); three episodes of The Invaders (as a benign variation of the Klaatu persona, culminating in a parallel plot also involving an assembly of world leaders); an episode of I Spy ("Lana"); and two episodes of The F.B.I. ; and was a THRUSH agent in an episode of The Man From U.N.C.L.E. (1967 TV series) ("The Thrush Roulette Affair"/Barnaby Partridge). Also Branded. He had a son, John Marshall (born 1944), with his longtime friend and mistress, Renée (née Gilbert), whose later married name was Taylor. Renée was the sister of the British film director Lewis Gilbert. During the war years, they lived coincidentally in flats in the White House in Albany Street near Regent's Park in London (now a hotel). The White House was a favourite location to live during the war years. It was built in the shape of a white cross and was such a good navigation mark for the Luftwaffe, that it was rumoured that there were standing orders to avoid bombing it – hence its popularity with celebrities and the wealthy. Although Michael offered to accept paternity on discovering the news of her pregnancy, Renée refused, as she was unwilling to jeopardise his growing success as a romantic lead in major feature films. However, Rennie kept a watchful eye on John Marshall over the years, even after his marriage to Maggie McGrath, and both families remained in constant touch until Rennie's death. In fact Renée and Maggie lived for many years in the 1970s and 1980s within 200 yards of each other in Barnes and were close friends. Both Michael Rennie and his sister Bunny were very fond of Renée's family. Coincidentally the British Film Institute's database lists Rennie as also having a son, John M. Taylor, who is described as "a producer." John Marshall Rennie used the pseudonym "Taylor" during his long career in the industry to avoid accusations of nepotism. The Invaders (1968), episode "Summit Meeting" – two part episode. ^ "Michael Rennie, Film and TV Actor, Dead at 621: ,Starred as Harry Lime in 'The Third Man' Series Had Role on Broadway in 'the Comedy 'Mary, Mary". New York Times. 11 June 1971. p. 38. ^ a b c d "Seeing His Worst Movie After 10 Years Assures Michael Rennie Part as Jean Valjean Is His Best" Scheuer, Philip K. Los Angeles Times 18 Nov 1951: D1. ^ "Actor Michael Rennie Dies; Starred in 'Third Man' on TV" The Washington Post, Times Herald); Washington, D.C. 11 June 1971: C6. ^ a b c d e "DEMAND FOR YOUTH". The Australian Women's Weekly. 9 (39). 28 February 1942. p. 14 (The Movie World). Retrieved 25 March 2017 – via National Library of Australia. ^ "News From The Talkie Studios". The Chronicle. LXXXIV (4, 804). Adelaide. 15 January 1942. p. 33. Retrieved 25 March 2017 – via National Library of Australia. ^ "We Introduce You To Some Of The Actors Who Take Part In". The Voice. 15 (29). Tasmania. 18 July 1942. p. 3. Retrieved 25 March 2017 – via National Library of Australia. ^ "FAMOUS STARS Return to the Fold". The Mercury. CLXII (23, 410). Tasmania. 15 December 1945. p. 9. Retrieved 25 March 2017 – via National Library of Australia. ^ "I'll Be Your Sweetheart". Variety. 11 July 1945. p. 14. ^ "Australian Actor, John MacCallum, Has Lead In New English Film". The Argus (31, 031). Melbourne. 13 February 1946. p. 7. Retrieved 25 March 2017 – via National Library of Australia. ^ "His tour of Britain exhausted this new star". The Australian Women's Weekly. 13 (37). 23 February 1946. p. 31. Retrieved 25 March 2017 – via National Library of Australia. ^ "Martini Had Clothes And". The Sun (11, 384). Sydney. 19 July 1946. p. 3 (LATE FINAL EXTRA). Retrieved 25 March 2017 – via National Library of Australia. ^ "Lucky contracts for Michael Rennie". The Australian Women's Weekly. 14 (23). 16 November 1946. p. 36. Retrieved 25 March 2017 – via National Library of Australia. ^ "BRITISH FILMS". The Sun (2317). Sydney. 7 September 1947. p. 19. Retrieved 25 March 2017 – via National Library of Australia. ^ "Michael Rennie". The Australian Women's Weekly. 21 (49). 5 May 1954. p. 47. Retrieved 26 March 2017 – via National Library of Australia. ^ Schallert, Edwin (21 November 1950). "Fitzgerald Coauthors Own Starring Subject; Rennie Wins 20th Pact". Los Angeles Times. p. A11. ^ "VARIED ROLES FOR THE AMAZING MR. RENNIE". Western Mail. 69 (3, 362). Western Australia. 8 April 1954. p. 25. Retrieved 26 March 2017 – via National Library of Australia. ^ "Fox to film story of Nazis in Greece: ' Arms of Venus' Involves Men Who Thought They Found Statue's Lost Appendages". New York Times. 28 January 1952. p. 14. ^ TV Review: ' Climax' Show Melds Felony and Comedy By J. P. SHANLEY. New York Times (1923-Current file); New York, N.Y. [New York, N.Y]02 Dec 1955: 55. ^ a b Page, Don (7 June 1959). "The Third Man: Harry Lime Will Be Newest TV Hero Harry Lime to Be Hero". Los Angeles Times. p. G8. ^ "Rennie Twice to Star as Demolition Man; Mature's Lead Chosen" Schallert, Edwin. Los Angeles Times' 5 Oct 1957: B3. ^ THOMAS M. PRYOR (13 May 1957). "CAROL REED HERE FOR MOVIE TALKS: British Director to Discuss 2 Story Properties With Hecht-Hill-Lancaster Lanchester and Laughton Of Local Origin". New York Times. p. 27. ^ "Women In English Film-making". The Chronicle. LXXXIV (4, 824). Adelaide. 4 June 1942. p. 28. Retrieved 25 March 2017 – via National Library of Australia. ^ "IN LONDON THIS WEEK". The Argus. Melbourne. 22 December 1956. p. 4. Retrieved 25 March 2017 – via National Library of Australia. ^ "Michael Rennie Granted Divorce by Stipulation" Los Angeles Times 19 May 1960: 18. ^ "Michael Rennie Must Pay Wife $250 Month" Los Angeles Times 14 May 1959: 2. ^ "Actress Testifies In London Court Drama". The Newcastle Sun (11, 273). New South Wales. 13 August 1954. p. 1. Retrieved 26 March 2017 – via National Library of Australia. ^ "Mother found strangled". The Sun (13, 805). Sydney. 11 May 1954. p. 1 (LATE FINAL EXTRA). Retrieved 26 March 2017 – via National Library of Australia. ^ "DEATH In The Actor's Flat". The Sun-Herald. New South Wales. 16 May 1954. p. 56. Retrieved 26 March 2017 – via National Library of Australia. ^ "Preminger Levels New Charges of Indiscretions: Producer Links Wife and Michael Rennie in Supplemental Complaint" Los Angeles Times 10 Jan 1959: B1. ^ "Michael Rennie Must Pay Wife $250 Month". Los Angeles Times. 14 May 1959.